I’ve been a BzzAgent for some time now, and recently signed up to try out the new CoverGirl NatureLuxe line of makeup. First, let me explain that I received two items free of charge to try out-and offer my opinion on through BzzAgent. 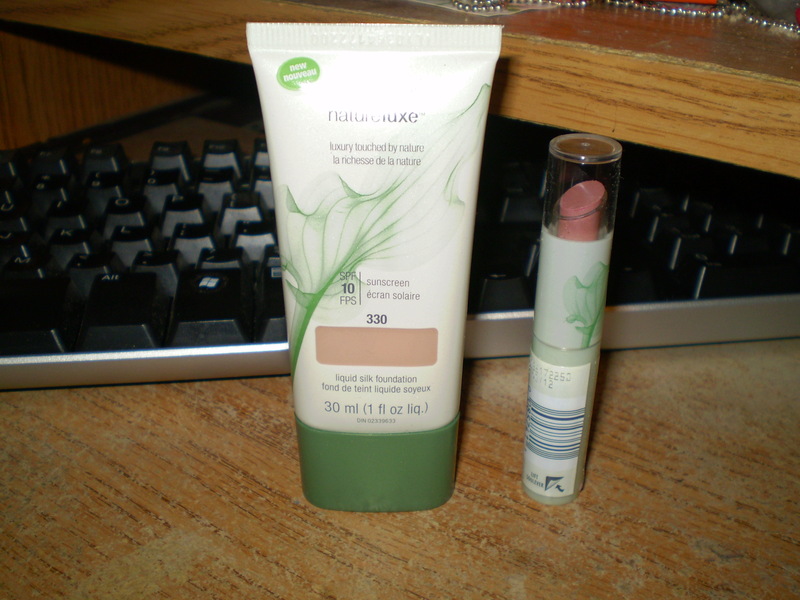 When the package arrived, I was surprised to see that this foundation also had the added benefit of SPF 10 sunscreen. Granted, it’s not the SPF 30 that I am used to-but I have to admit, ANY sunscreen (for the times that we all forget to put it on, me included) benefit in a foundation is definitely a plus. I am not a huge foundation wearer, when I was younger I used to wear it occasionally-but it always felt caked on and some of the gals from the 80’s (my era, lol)literally wore it as a mask-whenever they smiled it would crack, and you could see the tell tale white skin around their hairlines and under their chins where the foundation stopped and their true skin color began. Nowadays, I just use foundation for my under eye circles, blending in a light color to go with the rest of my face and hoping to not look like a raccoon. The first thing I noticed was that it has a pleasant scent-and a light texture. Rubbing it in a few spots I noticed I didn’t feel like it was suffocating my face, and instead, allowed plenty of room for my skin to breathe. Some of these foundations are so heavy, and this was not one of them. I am glad that this provided a creamier, lighter version of most foundations I had gotten accustomed to, and I can definitely see myself using the Alabaster shade in the near future. Another product that was sent was the CoverGirl NatureLuxe gloss balm for lips shade 235 Grenache, with another added benefit, this time SPF 15! Considering your lips can get sunburned, I loved this. I really liked the fact that it left my lips feeling soft and lasted awhile without running or bleeding. I love pinks, so the Thistle 210 and Tulip 205 shades are on my TO BUY ASAP list since they look gorgeous! These 2 products definitely get a thumbs up in my opinion! You can find them in your local drugstores, online, and of course at Walmart, Kmart and other similar stores. The prices are reasonable as well, between $6-10 each so it won’t break the bank either. Thanks to BzzAgent and CoverGirl for providing me with the products needed to do this review. Disclosure: As stated in my review, I am a BzzAgent and was provided the products in order to review them and offer my honest opinion. All opinions above are my own based on the products I received.